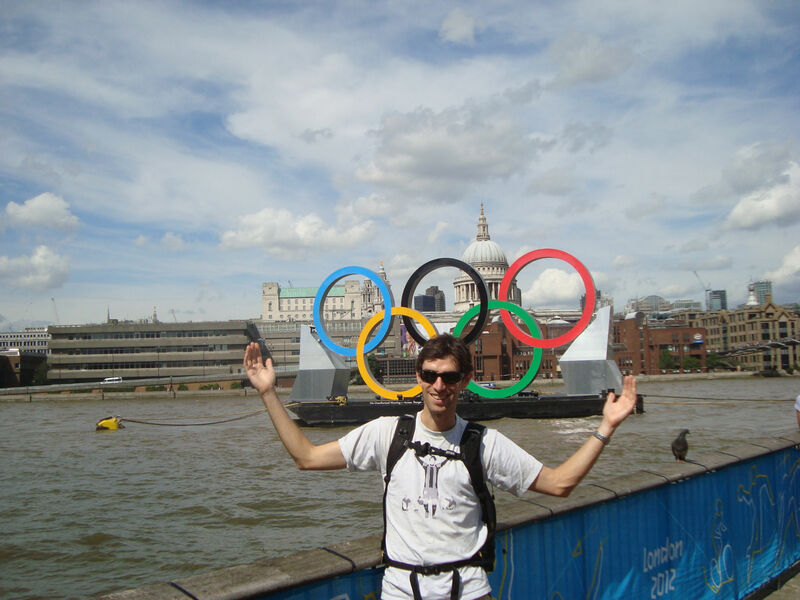 I was lucky enough to spend 4 days in London last week and got to experience the amazing buzz that pervades the city during the 2012 Olympics. We were lucky enough to witness some truly memorable sporting moments, such as the photo finish in the women’s triathlon; raising the roof off a pub cheering on Team GB’s exploits of Jess and Mo on the track; raising another roof in the ExCel during Katie Taylor’s quarter final fight and also discovering a new love of women’s weightlifting, where we saw several Olympic and World Records set by some scarily strong women. Here’s part 1 of the lowdown. The London Olympics 2012 have so far been a spectacle, showing off this amazing city in a blue and red tinged, Union Jack waving, Team GB supporting fanfare, which has captured the world’s attention. Without doubt the Olympics trump the World Cup, Superbowl or Champions League for captivating the minds of so many nations and people. Many of these Olympic followers wouldn’t consider them religious sports fans, in the same way as a Manchester United season ticket holder might. However watching Man U’s millionaire superstars kick a leather ball around for 90 minutes seems to pale in significance, drama and passion compared with the most benign and innocuous of Olympic sports. The sheer novelty of discovering the terminology of swimming, diving, archery, sailing, volleyball, weightlifting, walking, canoeing, track cycling and fencing leaves us all the more enlightened, and confident we can explain what the terms “omnium” or “épée” mean should they ever appear in a table quiz. I flew over with my cousin Pádraig on Friday morning and had a day of leisure before the action for us started on Saturday. We soaked up the atmosphere in the city by wandering along the Southbank from London Bridge to Westminster Bridge. 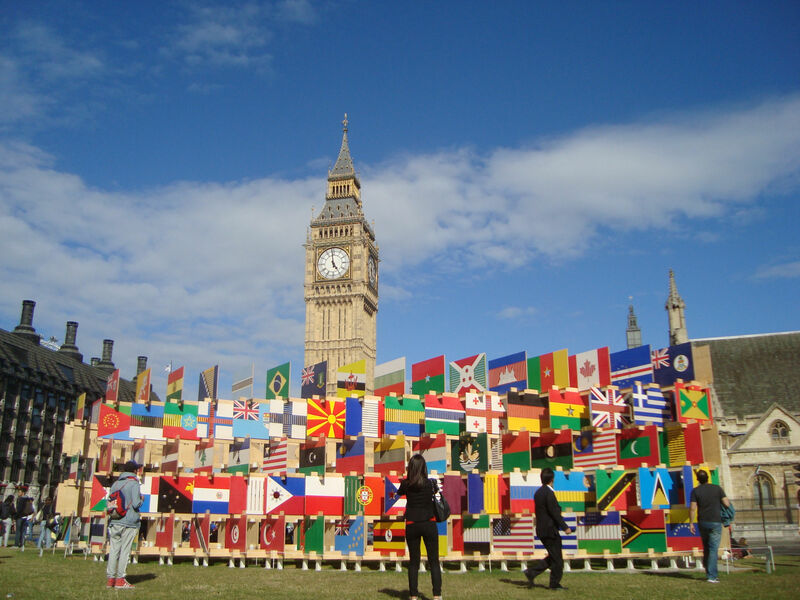 The crowds were great, with lots of flags and country colours on display amongst the tourists. 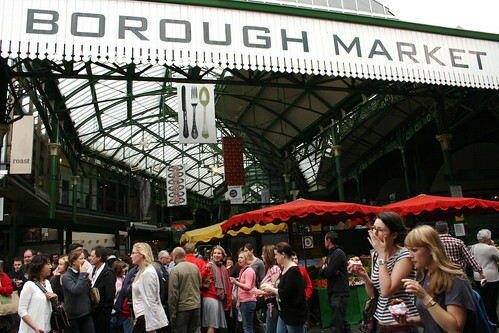 We refuelled in my favourite London market, Borough Market, where the international vibe among the stalls helped get us in the mood. I sampled a wild boar burger, some amazing chilli olives and the delicious Portuguese pasteis de nata. Friday night we checked out Ronnie Scott’s famous jazz club in Soho, where we got some Latin vibes from Robin Jones and his amazing band. Up for an early start on Saturday to get a good viewing spot for the women’s triathlon in Hyde Park, which kicked off at 9am. Over 500,000 people watched the race which took in an iconic route past many sights such as the Serpentine, Hyde Park, Buckingham Palace and the Wellington Arch. You’ve all heard about the dramatic finish, where Spirig (SUI) took gold by a millisecond from Norden (SWE). 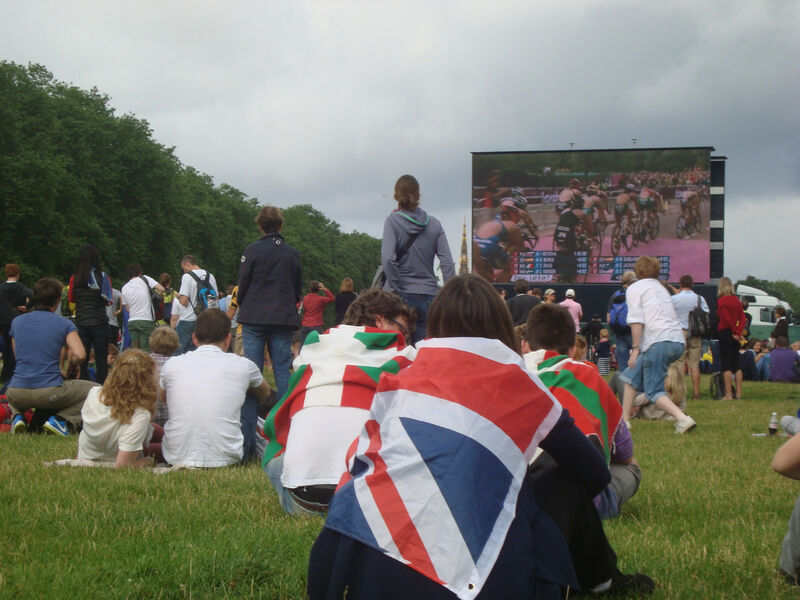 It was so exciting, watching it on the big screen in Hyde Park. It’s a pity Aileen Morrisson (IRE) had a crash on the bike, as the slippy road conditions caused chaos on the early laps. It was a great event to be at – there were huge crowds lining the Serpentine and the big screens made it easy to follow the action as it progressed. 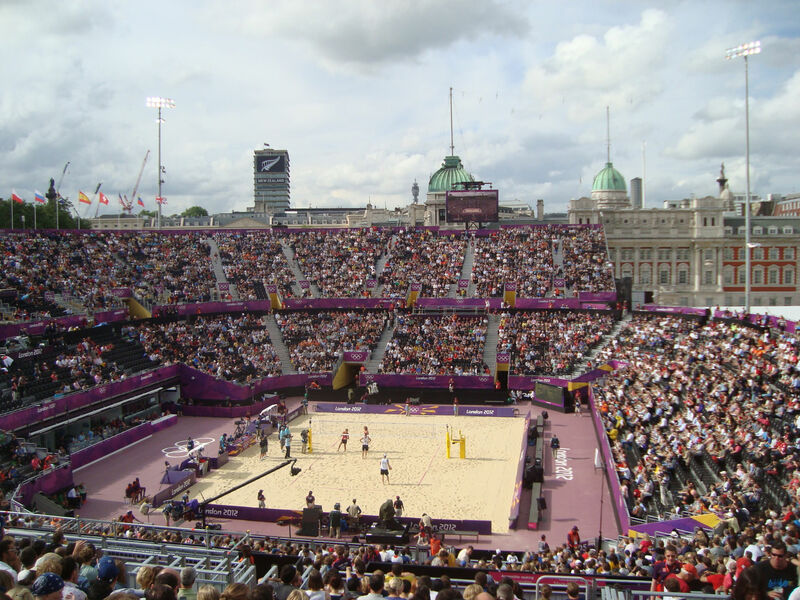 That afternoon we had tickets to the Beach Volleyball in Horse Guards Parade. I’m getting awful abuse for “suddenly” becoming a fan of this sport, however in the Olympic spirit I think we should all broaden our horizons and watch new sports. 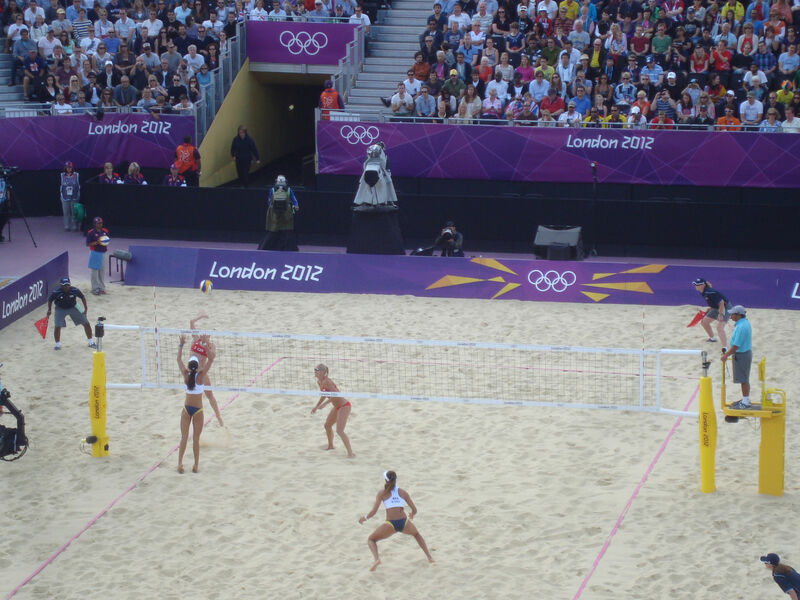 In the end, it was great craic, where the women’s match, Brazil vs Czech Republic, was as much about the 4 players on the sand as it was about the music, iconic venue, crowd, beer and dancers which made the afternoon such a laugh. The (blonde) Czech’s beat the (bronzed) Brazilians in a cracking 3 set match, which is punctuated by the stadium announcer jazzing up the crowd with dance music and various cheers. To top it all off, a troop of dancers hop out during time-outs to lighten the mood and show off their long tanned legs, bikinis and sharp dance moves. And it’s not an Olympic sport?